Groundnut is a good nutritious food to be taken as a evening chat. 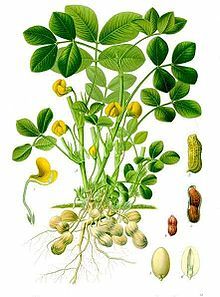 It got its name as it is reaped from the roots of the (groundnut) plant. It has its origin at Mexico, South & Central America and found its way to the other parts of the world. "Blood clotting" is an important function in our body. May it be small scratches, injuries or incisions during surgery, delayed blood clotting may be fatal. The nutrients in the groundnut helps proper blood clotting. Groundnut is a "Gift of God" to people with nasal bleeding and women with excessive bleeding during menstrual cycle. The vital nutrients like Protein and Phosphorus helps for the normal functioning of the cell tissues and for the enhanced functioning of the brain cells. The ample nutrients present in the groundnut helps for the rigidity of our bones. No other medicine than a cup of goat milk with some fried groundnuts and gur could serve as a major nutritious food for growing children, pregnant and lactacting mother. A cup of groundnut a day keeps away Tuberculosis and Jaundice. "Glycemic index" indicates the amount of glucose gained by our body through the food we take. Glycemic index is low in groundnut and hence it is a suggestive snacks for diabetics also. The Magnesium present in the groundnut helps for the effective functioning of the glands and fights against the diabetes. Many people avoid groundnuts thinking it to be fat rich and cholestrol producing. The fat present in the groundnut is 'unsaturated fat' and so we need not worry to consume groundnut and the foodstuffs made in groundnut oil. The cooking oils produce bad fats and transfat only at their "smoke point". While the smoke point for other cooking oils rests within 275 to 300, the smokepoint for the groundnut oil starts at 320 and hence bad fats are not produced easily while cooking with groundnut oil. But there is restriction on how to consume these nuts. It could be consumed either by boiling or frying but the thing is that it should be fresh from the lands. Groundnuts improperly stored for a long time produces 'Aflotoxin', which causes stomach upsets and lead to digestive problems and food poisoning also. Let us consume GROUNDNUTS as adviced by the "Father of our Nation - Mahatma Gandhiji". Eat healthy and live healthy.